Fourth of July, WHOA, that was a long time ago. It’s September now. I got married, I got honeymooned, I’m a married lady. The other friends of mine who got married this summer are also done and wedded ladies. My wedding season is over, and things are maybe, hopefully, fingers really crossed calming down? Enough for me to remember cooking and blogging and this little space. I have this huge backlog of recipes. I want to share them with you! I really do, but I’m not sure how to get them all out on the page quickly. I think maybe I’ll need to have a recipe binge, in which you forgive me for not having deep and pithy things to say about each and every thing I post. It’ll mainly be summed up by “YUM.” Because I wouldn’t have put it in the queue if it wasn’t amazing, but I think maybe I went and used up all my pretty word allotment for 2013 in my wedding vows. Wedding vows, they really bring out your perfectionist tendencies. Anyhoo. I want to get this backlog sorted out, especially because I just bought this little gem yesterday, and I am SO EXCITED to cook from it and maybe have some recipes to share with you. So let’s get to it, shall we? Feta: Whipped? Toasts. 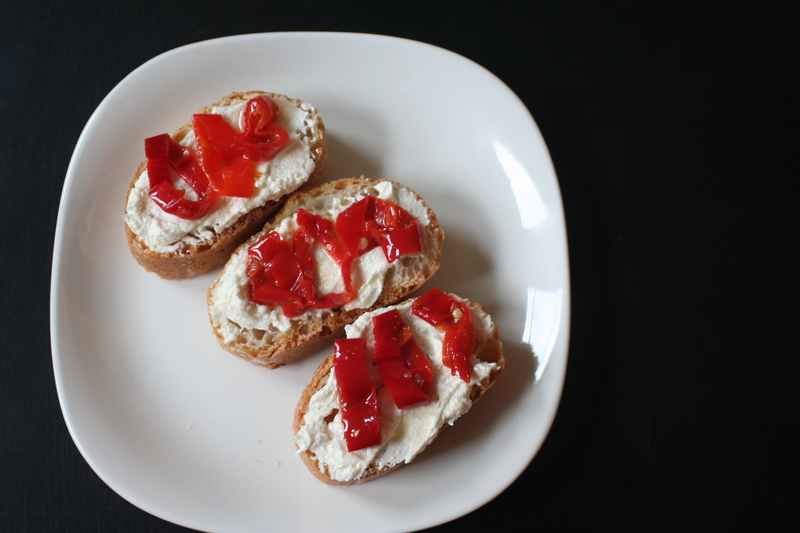 Presentation: If you’re planning on putting this on bread, you have two options: 1) arrange the tartines ahead of time for your guests and have someone set them out, or 2) set up a little station with bowls of whipped feta, slices of baguette, and delicious toppings. Personally, I like option 2, since it’s less work for you, your guests can make exactly the appetizers they want to eat, and people who don’t know a ton of other people at your event can strike up conversations while they’re putting together their food. And did I mention the less work part? I really like that part. Put the feta in a food processor, crumbling it a little if it’s not already crumbled. Blend it until it’s turned into fine crumbs. Add a tablespoon of olive oil and blend until it’s mostly smooth, adding another tablespoon if needed. Add the cream cheese, and puree in the processor until it’s very smooth and creamy. 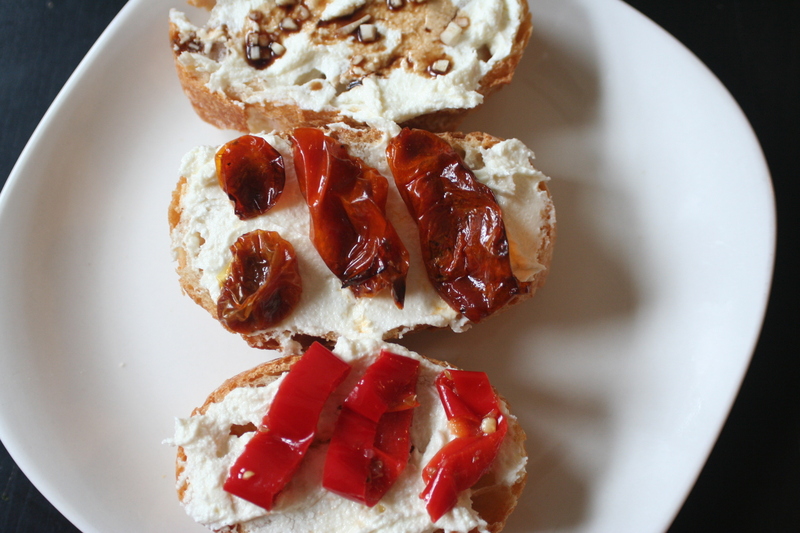 Spread it on to slices of baguette and top it with delicious things.